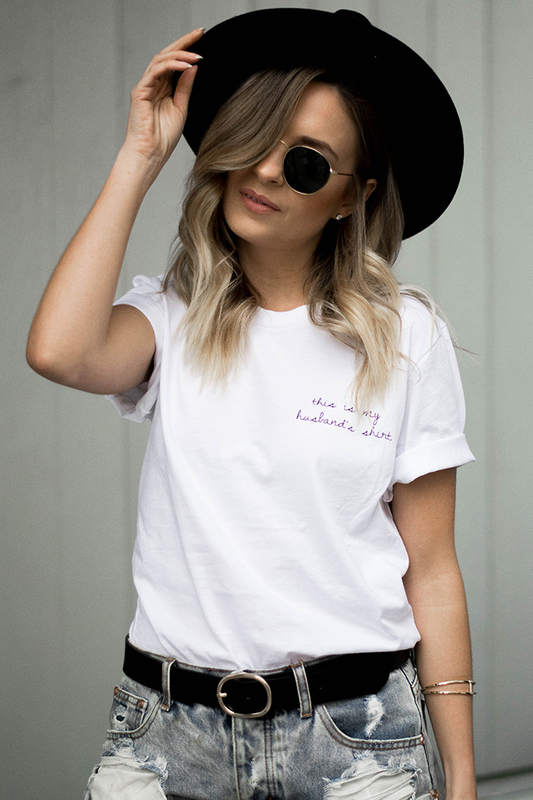 New MACCS the label tees have arrived and I am SO excited! 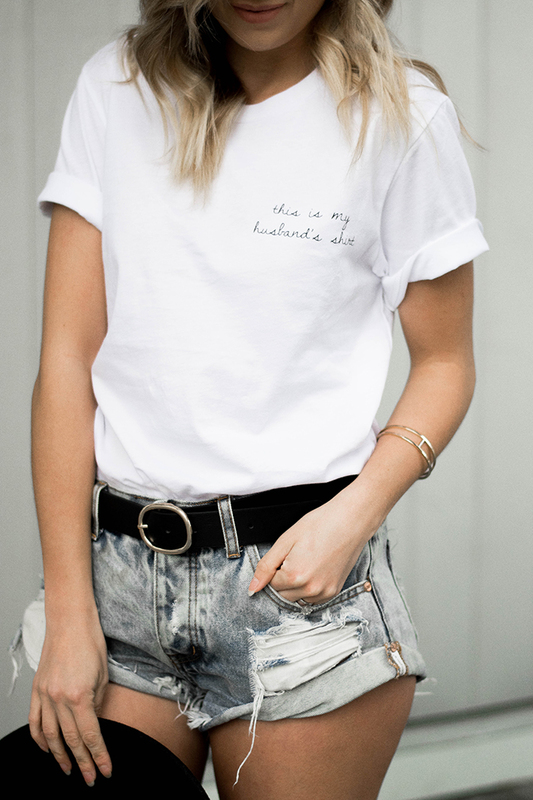 These tees are a unisex fit so they're nice and loose, and they're also super soft. 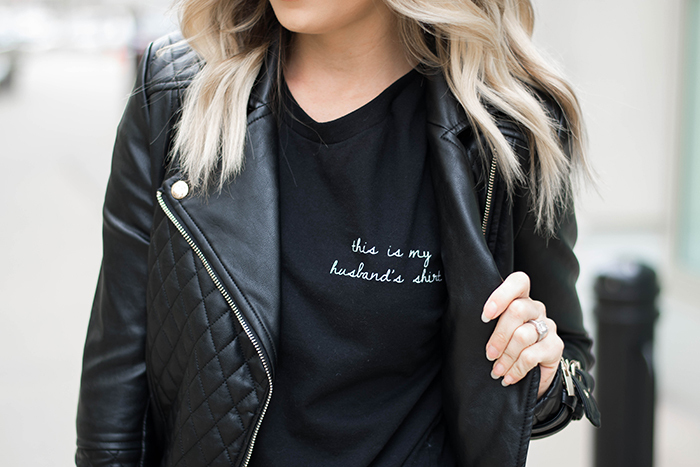 We really wanted to make something for bridal season but didn't want it to be anything too cheesy or bridal - we wanted something brides wouldn't be afraid to wear long after their 'I do's' which is why we created this super chic and cozy 'This is my husband's shirt' tee which comes in both white and black. I am the number one offender of stealing Danny's tees all the time because they are way more cozy than mine and I love wearing them with some great denim. 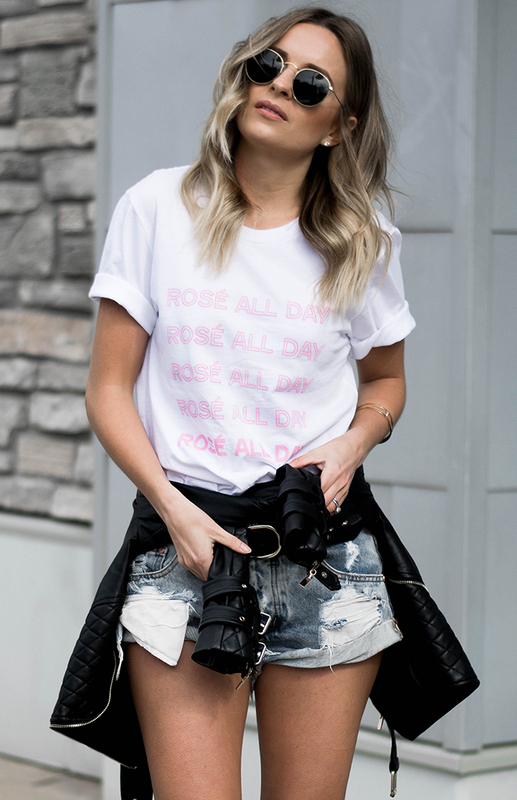 We also created this fun rosé all day tee which is a Spring staple - I love the sort of 'thank you' bag design we went with. I often get asked how I got into the fashion industry and how I started my business. So I thought I would delve a little bit into how I started my first business. As some of you may know MACCS the label is actually my second business, my first, Cake For Breakfast was founded back in 2011. Cake For Breakfast started as a jewelry line. I would go to my local Michaels, pick up some fun chain, beads, pendants etc. and make my little heart out. It was so much fun designing and coming up with new pieces all the time - my first little taste of design. I soon opened an Etsy shop. Etsy is such an awesome platform because it allows makers and entrepreneurs to easily open up shop without all the headaches and cost that comes along with creating your own site. I'm a big advocate of starting out small and growing with your business. Often times, businesses feel they need a fancy website with professional photography and all the bells and whistles, then, thousands (sometime tens of thousands) of dollars later, they can't sell stock fast enough to keep up with their expenditures. Sometimes an Etsy page and iPhone images are just enough to get you going (and they're free). As you grow and start to see sales you can reinvest those funds to the business and invest in some professional photography and your own platform. I started to see some sales trickle in and it felt amazing!! It always feels good when people are picking up what you're putting down. I had some fun playing around with jewelry for a bit and came out with a few pieces, then I decided to venture into graphic tees. I had a graphic in mind and wanted to make it come to life. I'm the type of person, when I have an idea, or something I want to do, I will go to the ends of the earth to make it happen. I asked around and made some phone calls until I figured out how I wanted them to be printed. I also found out the easiest way to make them would be picking up blanks (had anyone mentioned the word 'blank' to me in 2011 I would have had no idea what they were talking about). But there are companies out there that make t-shirt, hoodie, sweatpant etc. blanks which makes life a little bit easier because you don't have to go through the hassle of finding a manufacturer. Finding the right blank provider is only slightly tricky because you have to find one that will not be too expensive or have a super high minimum. Once I found my blank provider and my printer, I was golden, and thus, the ampersand tee was born. I created 24 tees and they sold out in 48 hours, needless to say I was so incredibly stoked. I should also mention that when I started Cake For Breakfast I was working full time for TD Canada Trust. I know some people might suggest quitting your job right out the gate and going for the 'all or nothing' approach. I would beg to differ. I worked full time, and made jewelry or packed orders on my days/nights off. It was great because I still had the security of my job and could watch my business grow naturally. I kept working up until 2014 - I had actually quit my job at TD and got a job in marketing, stayed there for three months, and left to work for myself. At that point, CFB had become so much more established that I had the confidence and security I needed to be able to leave my job. I also feel that my positions both within TD Canada Trust and marketing aided so much in preparing me for becoming a full time business owner. By the time I went solo I had acquired a wealth of knowledge in customer service, finance, graphic design, social media, trade shows, and the list goes on. I also had a boss from when I worked in marketing that was an entrepreneur and owned her own clothing line who told me to, no matter what, always get up and get ready in the morning, even if you are only working from your home office. She was so right. For anyone that was curious I hope I was able to answer some of your questions or for anyone that is in the same boat I was I hope this helped to give you a bit of insight into my story. I love sharing more around my business and that aspect of my life so if you have any questions please don't hesitate to drop me a line and I would love to include them in future posts!